a taste of summer...and a giveaway! On Sunday we were invited to a pot luck dinner. Now, I don't have a whole lot of experience with pot luck dinners by name, but I do have experience with "bring a side dish to share" barbecues and croquet parties, which in my mind are synonymous with the idea of a pot luck. The memories of these parties evoke thoughts of white dresses, sunshine and bare feet running across soft grass while chasing after brightly-colored balls, one hand grasping a mallet, the other a cold beer. In one word...summer. So when I was laying in bed Sunday morning and asked my hubb what we should prepare to bring to the pot luck that night, and he said "how 'bout your olive potato salad", it made perfect sense. 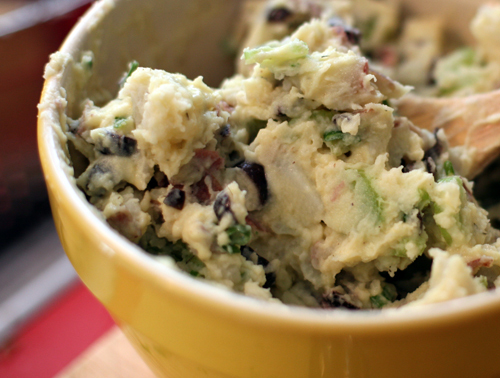 Of course, potato salad would be divine at the "pot luck" dinners of my mind. Unfortunately, the pictures in my head wavered when I opened the blinds that same morning and discovered a light dusting of snow covering the ground. It didn't take long for those warm, summer thoughts to be completely shattered when I checked the forecast and read about the 3"-5" of snow that were expected to fall on us over the next 24 hours. This was all a big surprise to me, since I ran in shorts in 60* weather just 2 days prior. Snowball fights and sledding, although enjoyable, were not part of my plan. After debating other options for a few minutes I decided to forge ahead with my summer-time favorite, regardless of the weather. This winter has claimed many of my on-the-road runs, most outdoor dining possibilities in Charlottesville and occasionally the feeling in my fingers and toes... I wasn’t about to let it have my premature potato salad too. Plus, potatoes are in season. 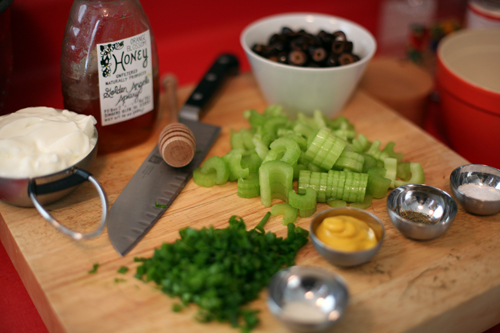 Its not my salad’s fault that I associate it with warm-weather fun and games. I found this recipe years ago and have made it many times, for most events where we are asked to bring a dish to share. 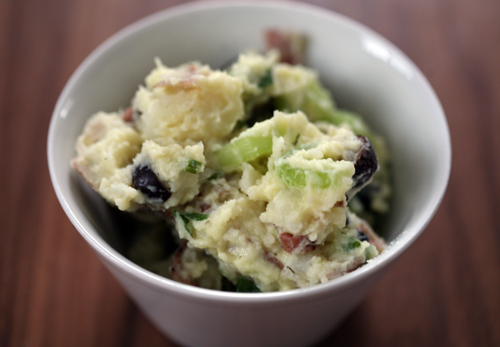 This potato salad is not only easy and delicious, it is also a much healthier take on the classic mayonnaise-dripping versions of my childhood. It will keep, covered and refrigerated, for about 5 days. My hubb is always happy to pack leftovers in his lunches no matter what time of year it is. He says it goes best with a turkey + pepper jack sandwich. 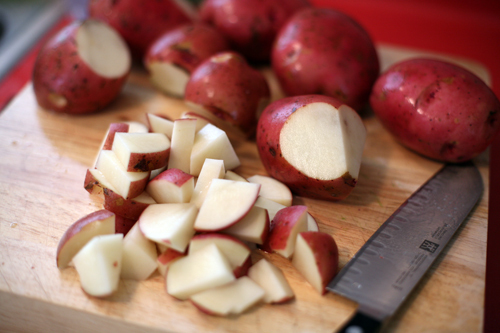 Boil potatoes in a large soup pot until tender, but not falling apart. Drain and allow to cool. 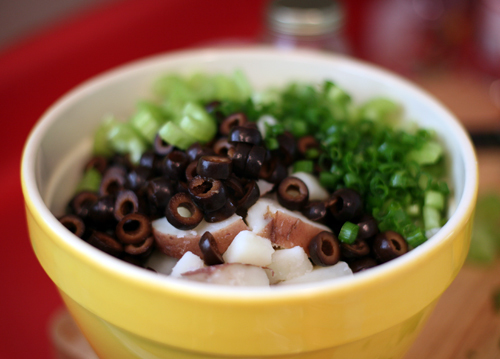 Add olives, celery and scallions to potatoes and gently mix. Whisk together the vinegar, oil, salt, dill and pepper. Pour over potatoes and gently mix to coat. Whisk together yogurt, honey, mustard and garlic salt. Pour over potato mixture and stir gently but thoroughly. Chill for 1 hour before serving. On the job front: My meeting went really well yesterday! I am very excited to tell you that I accepted a position with my hubb’s firm and will be starting on Monday. It is a huge relief to know that I will be transitioning out of one job and directly into another without any period of unemployment. I am amazed that the timing worked out so beautifully and feel extremely fortunate. Thank you all, again, for your continued support and lovely notes. Its been a loooooong week but I really think that everything has worked out for the best and am grateful to all parties involved for the graceful handling of the whole situation. It could have been much scarier had things not been handled so well. In blog news: You may have noticed that I’m trying something a little different this week, a few less posts that concentrate on specific recipes rather than my normal food diary format. There are many reasons for this, time and boredom being a couple of them. There was a day this week, Sunday I think, when I just could not bear the thought of telling you that I had my standard oats for breakfast and a salad for lunch. And there are only so many ways for me to photograph a sweet potato with edamame and corn on top. I just wasn’t enjoying writing my posts as much and didn’t like the pressure I was feeling to get a post out every single day, regardless of whether or not I had anything interesting to say. Sometimes, my days are boring and so are my eats, and I put ridiculous pressure on myself to try and make them interesting, which is where the time factor comes in. So this week has been a test, to see if I like this new format and if it aligns with the direction that I think I want to take the blog. I’m still working things out, but expect a decision, and a longer-winded post, sometime this weekend. Until then, thanks for reading. I appreciate each and every one of you. GIVEAWAY! I know you all saw the numerous bottles of Country Bob’s All-Purpose Sauce popping up in blogland a couple of weeks ago. 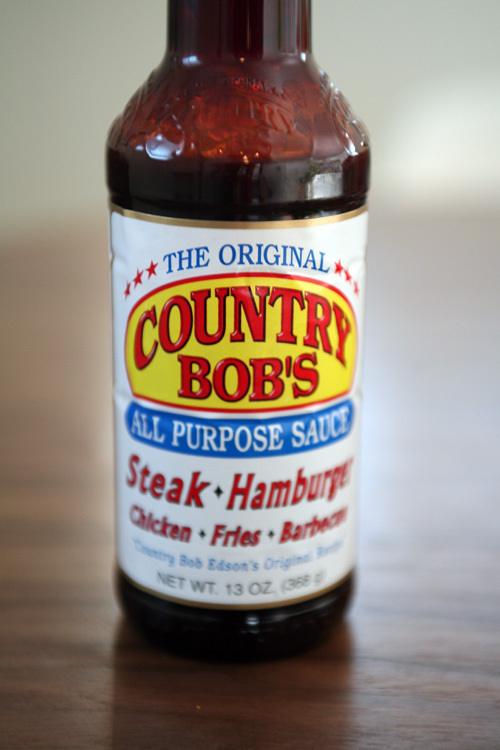 Unfortunately I received my Country Bob’s in the middle of a big deadline week at work, so didn’t get a chance to really rave about how wonderful this sauce is and how much I enjoyed it on baked chicken and as a dipping sauce for ‘taters and veggies. Its REALLY good, and I can’t wait to fire up the grill (maybe this weekend?!?) and try it out on some pork tenderloin. The kind folks over at CB’s have offered to give TWO of my readers TWO bottles of the All-Purpose Sauce. All you have to do is leave a comment on this post for one chance to win. If you mention the giveaway on your blog and link back to this post you will have a second chance to win. Do all that by midnight tomorrow (Friday) and I will announce the winners sometime on Saturday. Good luck!